Ten years ago, God set His alarm clock and woke me up to the reality that I’d lived on autopilot for so long it seemed there was nothing left of me. I had forgotten who I was. I had settled for doing what seemed right rather than being who He created me to be. I felt as if every mind-numbing insurance form and patient account detail that crossed my desk in my husband’s chiropractic practice sucked a little more life out of me. That emptiness was the price of sleepwalking through life. What did Jesus use to open my eyes and bring me back to the land of the living? The bottom line was the power of Christ-centered coaching combined with praying the Word. Hire an experienced coach. Check. Rediscover how God has wired me and choose to be fully me, fully alive. Check. Take personal responsibility for operating within my temperament, strengths, and gifting as much as it is up to me. Check. Set powerful goals that are within my ability and right to control. Check. Take action steps that line up with who I am and what is important to me. Check. Fully participate in professional Christian coach training to hone my own coaching skills. Check. Immerse myself in a community of coaches who affirm and value me and what I am called to do. Check. Be conscious of and honor how others are wired. Check. Pass it on so others can take it and run with it. Check. I began with the first item on my check list and hired professional coach Christopher McCluskey. My approach to the “Vicki Packet” he requested before our first session was eye-opening in itself. I prepared a three-ring binder full of both formal and informal assessments of my strengths and weaknesses, letters of recommendation from successful jobs as well as a job lost, creative project photos, and transcripts. My ears perked up at my coach’s words: “Wow, this really is a re-discovery process for you!” Over time, his powerful questions drew out the purpose of my heart, which lined up with my own Myers-Briggs results: to make a difference in creative and insightful ways that help people grow. 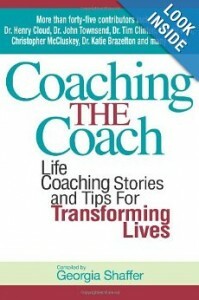 Judy Santos, who launched the Christian Coaches Network in 1998, warned me one week, saying, “You can’t hit a home run every time, Vicki!” and the next week, said, “You’re the best I’ve ever seen at this temperament-based coaching.” Her affirmation deepened my sense of calling to facilitate this process of cooperating with God’s design for those who are ready and coachable. My coaches’ respectful, honest, and challenging feedback, as well as opportunities to step outside of my comfort zone to serve as a faculty member in the world of professional Christian coaching, came with the opportunity to say “Yes,” “No,” or “Renegotiate.” I am honored they saw the real me in spite of my struggles and welcomed me warmly into their community of coaching colleagues. This dynamic process accomplished God’s life-giving work in me. These days, “Fully You, Fully Alive” is more than my tag line; it is a recurring theme through my life coaching, mentor coaching, and retreat coaching, all of which are temperament-based. What’s my powerful goal? To be just plain Vicki with Christ as my life, to be the best Christian coach God will have me be, and as much as it depends on me, to help others live out their unique God-given purpose in a way that brings them life and Him glory. God knew I needed an experienced, competent coach who cared enough to focus on my agenda; to be fully present in co-creating our relationship of trust and intimacy; to communicate effectively through deep listening, powerful questions, and direct communication; and to encourage my personal responsibility for doing the work that would give the greatest sense of progress between sessions. These are the basic coaching competencies we need to practice and demonstrate with such a high standard of excellence that we are then freed up to bring our own essence and being into the conversation. I am confident that as we join in community with other experienced Christian coaches, our clients will be better served, our collective vision will be strengthened, and God will be glorified. How I approach coaching is personalized to most effectively draw out clients of various personality styles, strengths, and preferences. Your insights into what motivates your client (what to say “Yes” to) as well as potential Achilles heels (what to self-manage) can be invaluable in your shaping powerful questions to help your clients achieve awareness in their lives and figure out how they can realize their dreams. I’ve learned that what I needed as a client plays an important role in what I am inspired to give my coaching clients and my students in the Essentials of Coaching classes, Coaching Skills Development practicum, and Coaching Skills Mastery practicum I teach. My way of organizing my first packet stands out in sharp contrast to how some of my clients handle their initial packets. Scribbled notes and goals presented on a napkin immediately before a coaching session don’t necessarily show lack of motivation but speak volumes about the need to take into account individualized approaches and styles. For me, an extrovert, I enjoy the give and take of a coaching session with interactive conversation where we can brainstorm and launch new, challenging pursuits. I find this even more energizing than drinking a steaming hot cup of coffee. I thank God for His gracious wake-up call. He took what I needed to learn, combined it with my strengths and preferences, and turned it into a blessing that goes beyond all I could ask or imagine in my second half of life. Be Aware of how you, the coach, are wired. What energizes you? How do you take in information? How do you prefer to make decisions? How do you like to approach your world? Be Conscious of how your clients are wired. What energizes them? How do they take in information? How do they prefer to make decisions? How do they like to approach their world? Talk your client’s language. How can you communicate in ways that show you understand what’s important to them? What will draw out the purposes of his or her heart? What word pictures would take the conversation to a deeper, more meaningful level? When you begin to talk your client’s language, you will discover new ways to coach in the two major areas that potentially drain people the most. The first area is unresolved conflict, and the second is operating outside of their strengths, temperament, and gifting. If you can help a client address these two areas, you energize each one to pursue true passions and bring added value to the coaching relationship. It pays to respond to God’s wake-up call! What is God impressing on you in this season of your life? How will you respond to His wake-up call?